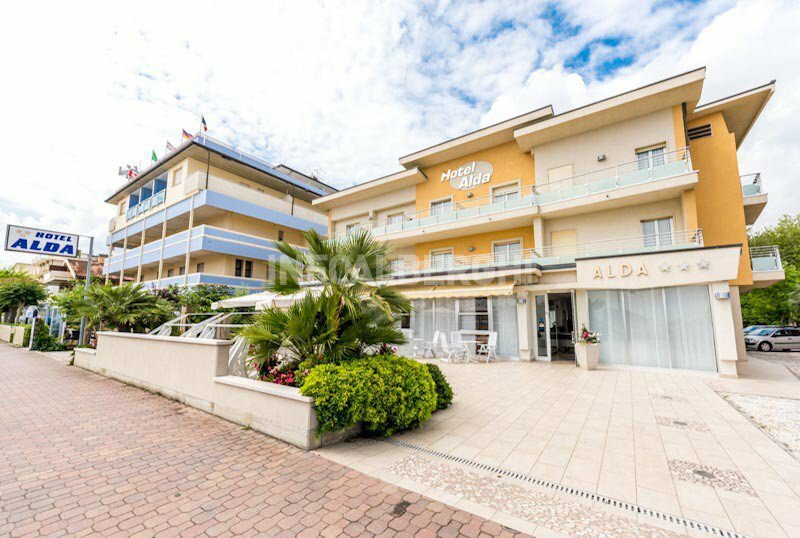 Hotel Alda is a modern and welcoming 3-star hotel in Cervia, offering its guests parking, WI-FI internet access, air conditioning and traditional local cuisine. Small pets are welcome. The hotel overlooks the seafront of Cervia and it is enough to cross the road to find yourself at the beach. In a few minutes walk you can reach the long canal where you can find the most popular restaurants and clubs and the historical center of the city. The hotel rooms have air conditioning, WI-FI, digital terrestrial TV, safe, telephone, private bathroom with shower and hairdryer. LEVANTE: comfortable, bright and with a balcony facing the sea. LE SALINE : with balcony overlooking the internal courtyard of the hotel. LA BURCHIELLA: they are located on the mezzanine floor. I'm without a balcony. FAMILY: for connecting groups, connecting rooms are available. Hotel Alda offers a garden equipped with chairs, tables and parasols, a terrace, free use of bicycles, a lift and a bar. AIR CONDITIONING: throughout the entire hotel, at no extra cost. BREAKFAST: buffet with both sweet and savory dishes. LUNCH AND DINNER: the kitchen prepares a choice of menus with 3 or 4 first and second courses of meat and fish and a vegetable buffet. Pasta and desserts are homemade. OTHER: Sunday, for lunch, an aperitif on the terrace with a surprise menu is served. The hotel has an agreement with Bagno Daniele, Bagno Anna, Bagno Flores and Bagno Savini, all equipped with entertainment, playgrounds for children, nursery, showers, WI-FI connection, playgrounds and bars. Prices are per person per day and for a minimum of 3 days. ALL INCLUSIVE: generous buffet breakfast; lunch and dinner (buffet of vegetables, meat and quality fish, 3/4 choices for both the first and the second); 3 bottle of mineral water and 1 bottle of local wine 3/4 labeled Sangiovese or Trebbiano a day and a family; 1 umbrella and 2 sun beds, from 4 ° line, and use common booth at participating establishments. FULL BOARD: full breakfast buffet; lunch and dinner (buffet of vegetables, meat and quality fish, 3/4 choices for both the first and the second); and 1 bottle of water per adult. HALF BOARD: full breakfast buffet; lunch or dinner (buffet of vegetables, meat and quality fish, 3/4 choices for both the first and the second). - Meals not eaten will NOT be deducted. - Occasionally, the Hotel NOT effect the only bed and breakfast.